As this last batch of days is a little more complicated and needs a bit more explanation, we'll be posting one by one! As it was super sunny, we were definitely inspired by the colour yellow for Day 20! 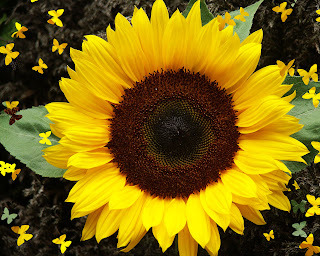 And what better way to get in the summer spirit than with Sunflowers! Laaavely! Six easy steps to achieve this design! 6) Finally, finish your design off with a clear cover coat to protect it! And voila! A lovely summery nail art design to brighten anyone's day!